Internationally acclaimed Israeli film director Eran Riklis visits campus beginning Aug. 26 for film screenings, lectures, classroom discussions and more. Photo courtesy Strand Releasing. 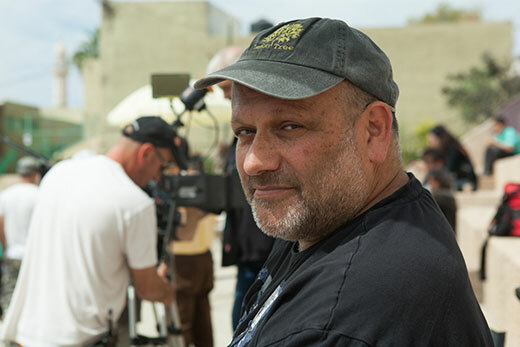 Emory's Department of Film and Media Studies will host internationally acclaimed Israeli film director Eran Riklis as a Schwartz Foundation Artist in Residence, beginning Aug. 26. During "Forging Cinematic Identities: Eran Riklis," the director will present, introduce and discuss three of his films, deliver three lectures on the history of Israeli cinema, visit classes and supervise a student filmmaking project. Riklis is one of Israel's most acclaimed filmmakers and has been working as a director, writer and producer for more than 30 years. He is best known in the United States for "The Syrian Bride" (2004) and "Lemon Tree" (2008). Riklis' film "The Human Resources Manager" won five 2010 Ophir Awards (given by the Israeli Film Academy), including Best Film and Best Director, and was Israel's official submission that year to the Best Foreign Film category of the Academy Awards. His most recent film, "A Borrowed Identity" (aka "Dancing Arabs"), had its American premiere at the 2014 Telluride Film Festival and opened in theaters this summer to uniformly strong reviews. "Riklis' films are celebrated for their humane, sensitive and understated exploration of the intimate and complex relationships between men and women, and between Israeli Jews, Israeli Arabs and Palestinians," says Matthew H. Bernstein, chair of the Departmetn of Film and Media Studies. "As they explore the nature of identity, and more specifically what it means to be Israeli, his films are an eloquent cinematic voice for common understanding among various peoples, cultures and traditions, a voice that has never been more relevant than in the past three decades," Bernstein says. Riklis' residency is co-sponsored by the Donna and Marvin Schwartz Foundation Artist-in-Residence Fund, the Department of Film and Media Studies, the Halle Institute for Global Learning, the Hightower Fund of Emory College of Arts and Sciences, the Tam Institute for Jewish Studies, the Israeli Consulate of Atlanta, the Atlanta Jewish Film Festival, the Department of History and the Department of Theater and Dance. "Forging Cinematic Identities: Eran Riklis"
The personal is very political in this lively road movie set in 1982 and shot in alternately desolate and beautiful landscapes. An unlikely pair, a Palestinian teenage refugee Fahed (Abdallah El Akal) and Israeli Air Force pilot Yoni (Atlanta-born Stephen Dorff) leave Beirut together during the Lebanon War to return home: Fahed wants to plant his father's small olive (zaytoun in Arabic) tree in his family's home in the territories, and Yoni wants to return to Israel to fight another day. Lecture: "Israeli Cinema: The Way We Were"
Israel is made up of a variety of origins and cultures — Jews who came from the East, West, North and South to a land that changed from Palestine to Israel in 1948, a land in which Arabs and Jews found themselves fighting to define their identity. This lecture looks at how this multicultural society was reflected in early Israeli cinema. Lead sponsor: the Halle Institute for Global Learning. Register here. When an Israeli Defense Minister moves next door and demands for security reasons that it must be destroyed, a Palestinian widow (Hiam Abbass) struggles to save her family's faltering but long-standing lemon grove. Riklis and Arraf re-teamed to write this measured, sensitively told and beautifully realized story, with especially strong performances by Abbass and Ali Suliman as her attorney, who takes the government to court. Lecture: "Israeli Cinema: Forging an Identity"
Is it possible to merge numerous different cultures, religions, histories and politics in to one coherent voice? An Israeli voice? What is an Israeli voice? This lecture examines the new Israeli cinema that emerged in the 1980s and how the Israeli identity is defined and re-defined. Lead Sponsor: Consulate General of Israel. Lecture: "Of Conflict and Optimism: My Personal Cinematic Voyage"
Conflict and optimism don't walk hand in hand, but perhaps an optimistic outlook is the only way to look at and attempt to understand the roots of the conflict in the Middle East and how it's reflected on a local, regional and global level through the prism of Riklis' films. Lead Sponsor: Tam Institute for Jewish Studies.